1. My Button Accordions: Single-Action and Diatonic. My button accordions are all single action instruments. By this, I mean that the single action of pressing a button can produce one sounding note when the bellows are being pushed or compressed, and a different one when the bellows are being pulled or expanded. This way, a treble row of ten buttons can produce twenty different sounding tones. My accordions have twenty-one treble (right-hand) buttons, in two rows. Except for its top button, each row is diatonic, that is, based on collections of seven notes. For example, a row in the key of C will give the tones (or notes) C, D, E, F, G, A,and B. With repeats at higher pitches, this covers just over two octaves. For my accordions, each treble note is produced by a pair of metal reeds. The two reeds in each pair are tuned to slightly different frequencies to give the note a richer sound, most noticeable with higher pitches. My accordions have four bass and four chord buttons on the left, arranged in two rows. The top two outside buttons (Chord & Bass) are most commonly used in conjunction with the outer row of the right (treble) side. The bottom two outside buttons (Chord & Bass) are most commonly used in conjunction with the inner row of the right (treble) side. Each bass note on the left side is typically produced by two lower frequency reeds, tuned an octave apart. My C bass-button, for example, gives a superposition of the C and lower C tones. Each chord on the left is typically produced simultaneously by three reeds. For example, the C chord contains the notes C, E and G. It so happens that these three tones sound great together; they are in harmony (or accord) with each other and thus they are said to form a major chord. 2. An Outside View of Button Accordions. They all have a treble side whose buttons are played by the fingers of the right hand. All have a bass/chord side whose buttons are played by the fingers of the left hand. Between the two sides, they all have bellows which can be pushed and pulled. All have an air button or lever, controlled by the thumb of the left hand, that helps regulate the amount of air inside the bellows. They may have different numbers of treble rows, typically one, two or three, and sometimes fractions of a row. The treble rows may have different numbers of buttons, typically ten or eleven, but sometimes as many as twelve or thirteen. They may have different numbers of bass/chord buttons, typically four, eight or twelve, but sometimes as many as eighteen, and sometimes just two. The musical keys of their treble rows, and the corresponding bass and chord buttons, can be different..
3. 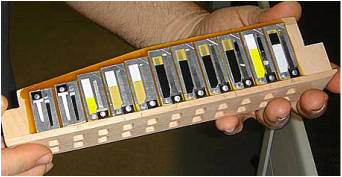 An Inside View of Button Accordions. 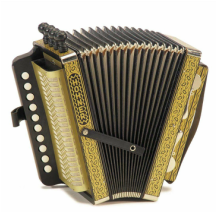 With the diatonic accordion, bellows pushed and pulled by the player forces the air past the sets of reeds, causing them to vibrate. The reeds are of different sizes, giving us the different pitches of sound. Half the reeds are activated on the pull of the bellows, and half are activated on the push, giving us twenty different tones for a row of ten buttons. 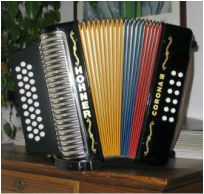 The accordion's tones are each produced by two or more reeds vibrating simultaneously, giving a richer sound. 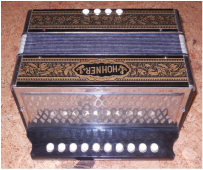 In spite of external differences, the accordions shown above are internally more similar than different. 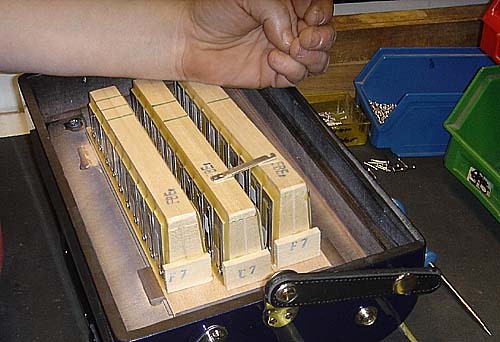 All get their treble sound from vibrating metal reeds, usually arranged in pairs along long wooden blocks, with a single block for each row of buttons, and, in most cases, with two pairs of reeds (push & pull) for each button in each row. 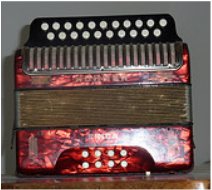 The photo at right (top) shows a single reed block, and the photo just below it shows the three treble reed blocks in a Hohner Corona II, a triple-row accordion. 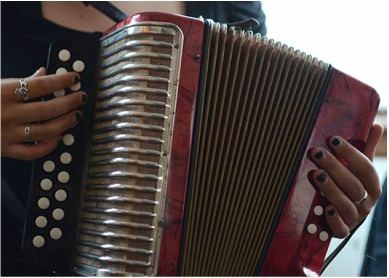 The bass and chord side of these accordions are also more similar than different. Most bass buttons have one pair of reeds, typically tuned an octave apart, for the pull, and another pair for the push. The chord buttons typically have three (or more) reeds for each chord on the push, and another three (or more) reeds for the pull. It's time to move on to our next challenge, which is to learn some fundamentals about the music you can play on the accordion.